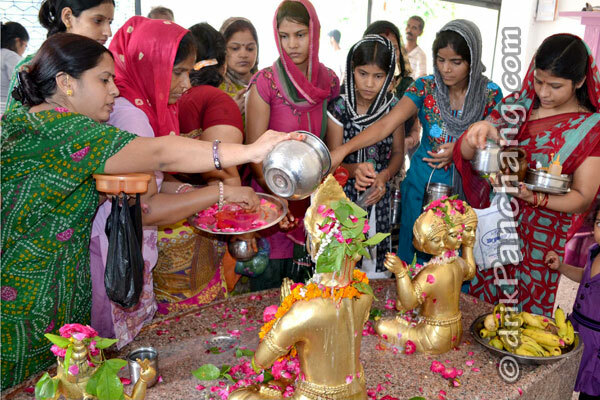 In North India, the first Somwar of Sawan was observed with religious fervor. The July 29, was the first Monday of Shravana month. Devotees, especially women, observe fasting on all Mondays during Sawan month. In North India, devotees, who observe Sawan Somwar fasting, eat only single Satvika meal in the evening. As most of the Shiva temples arrange special Darshan in the evening, Shiva Abhishekam is performed in the morning before noon. Devotees perform Milk and Jal Abhishekam in the morning and worship Lord Shiva, including Parvati, Ganesha, Kartikeya and Nandi with full devotion. Various items like Bel Patra, Dhatura, Aak flowers which are beloved by Lord Shiva are offered to Him during Puja. 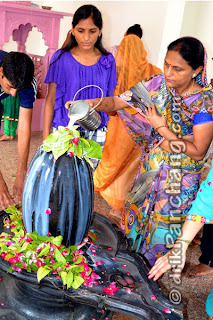 Most people perform Shiva Abhishekam with the milk or water. However Abhishekam can be done with various liquid items depending on the purpose. The item for Abhishekam for various purposes is listed below. The list of all Sawan Somwar can be checked at Sawan Somwar Days for any location in the world.